Your embroidery machine user manual will provide instructions about using and maintaining your embroidery equipment, but it may not provide many machine embroidery techniques and tips. So here are a few tips to help you get started. This information can help you achieve better quality, and more colorful, embroidery results. Select an embroidery design that fits the type and weight of fabric you are using. Designs with a high stitch count work best on a heavier fabric; lower stitch count designs are best on lighter fabrics. The design size should fit your machine hoop area. You will also need to use a stabilizer as a foundation for your design, so that the fabric will be held stable while the stitches are formed. The stabilizer will help prevent warping or puckering of the fabric. Use clean, fresh needles in the correct size, changing them as often as necessary — even while stitching a design. 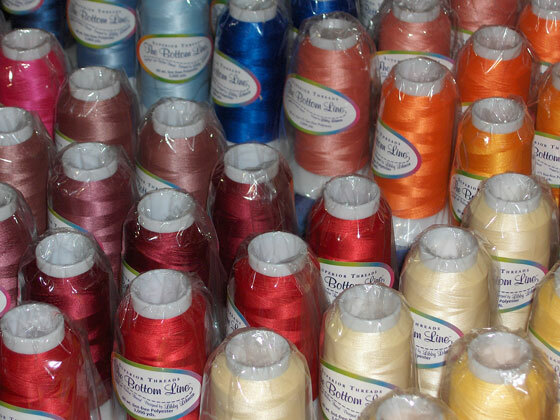 Quality embroidery threads are available in rayon, polyester, and cotton. Metallic threads, as well as acrylic and wool threads, are sometimes used to create different textures and appearances. Choosing thread colors for your designs lets you "paint the picture" according to your specifications. Experiment using different colors than those called for by the designer. Most thread manufacturers offer embroidery thread color charts. In addition to an embroidery machine, you can purchase a variety of machine embroidery products and accessories to facilitate your embroidery project and help make your embroidery designs more successful. Some of the more notable manufacturers and suppliers are listed below. Provides needlecraft educational materials and sewing products, including embroidery threads, fabrics, and instructional books. Features an extensive array of monogram designs for embroidery machines. Browse this collection of embroidery designs and machine embroidery solutions, including software, stabilizer, and instructional materials. Offers various types and colors of machine embroidery thread as well as project ideas and tips. 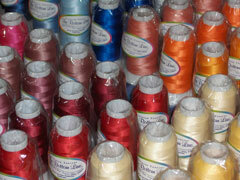 This decorative thread manufacturer offers threads in a vast array of fiber and color combinations. Their website also includes information about threads, stabilizers, and adhesives. Manufactures a wide range of embroidery scissors. Their site also features scissor maintenance instructions and tips. Embroidery Machines • us. All rights reserved.